Fresh corn is sweet, delicious summer fare. It's good on the cob, but for something different, try a quick sauté with green onions. And, for something more substantial, mix in some tasty, high-protein quinoa. This dish is good by itself, and it's also great with grilled chicken, steak, barbecue ribs, grilled veggies--basically any of the usual suspects at a summer barbecue. Start by cutting the corn from the cob. Get out a baking dish (something you might make brownies in), stand each ear of corn on its tip in the middle of the dish, and cut along the cob from top to bottom with a sharp knife. The kernels drop into the dish, and the sides of the dish should be high enough to prevent the corn from bouncing out onto the counter but not so high that they interfere with the action of the knife. Once the kernels are free from the cob, mix in some sliced green onions and sauté over high heat in a little olive oil until the corn is hot and lightly charred, a few minutes. Toss with cooked quinoa and season with salt and pepper for a quick, lovely summer dish. I've provided specific quantities below, but you can use as much or as little of any of the ingredients as you like. You need some corn, some green onions, some butter and olive oil for the pan, and some cooked quinoa. The only ingredients that really need to be measured are the quinoa and stock. You can use any amount of quinoa, but the ratio of quinoa to liquid should be one to two, by volume. Adapted from Vegetarian Cooking for Everyone by Deborah Madison. Serves 2-4 as a main dish or 4-6 as a side dish. Pour the stock into a medium-sized saucepan and bring to a boil over high heat. Measure the quinoa into a sieve and give it a brief rinse under cold water (Quinoa has a natural dusting of a bitter substance on the outside of each grain to discourage critters from eating the seeds. Some quinoa does not require rinsing, but better safe than sorry if you're not sure.) Add the quinoa to the boiling stock, cover, reduce heat to low, and simmer for 15 minutes, until most of the water is absorbed and the grains are soft and slightly chewy. Meanwhile, heat the butter and olive oil over high heat in a large nonstick skillet. Add the corn and green onions and cook, stirring frequently, until the onions are bright green and the corn is slightly charred, about 3 minutes. The corn will be somewhat crunchy. If you prefer softer corn, cook over medium heat for a longer time. 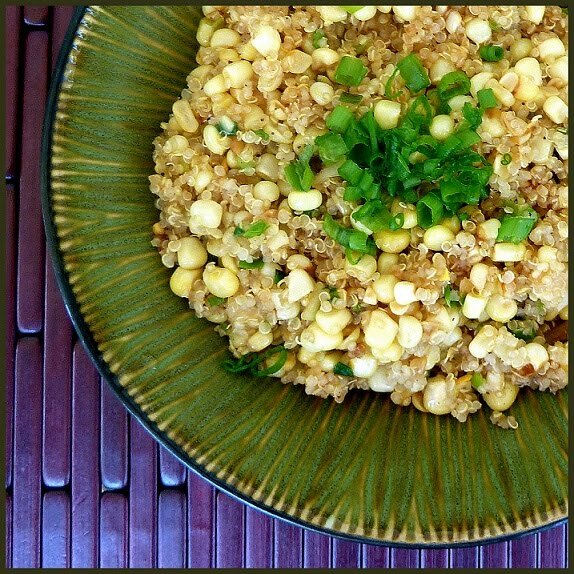 When the quinoa is ready, stir it into the skillet with the corn and green onions. Scrape up the browned bits on the bottom of the pan. Stir in lots of salt and freshly ground pepper, and garnish with the reserved sliced green onions. Enjoy hot or at room temperature.